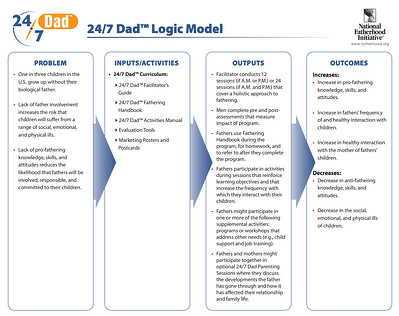 Developing a program requires a process for planning, implementing and measuring the success of all the organizations efforts—which is where the "24/7 Dad™ Logic Model" comes in handy. Once your organization has completed NFI’s Free Father Friendly Check-Up (which can help assess your organization’s leadership, program, and organizational focus as well as its engagement with the community,) a second important step, particularly for organizations that are starting a fatherhood program (or want to) is to create a logic model. Developing a program requires a process for planning, implementing and measuring the success of all the organizations efforts. A logic model is simply a picture of how your program works. It keeps your goals in view and shows the processes and activities connection to achieving that goal. It is a valuable aid to show potential partners and funders that solid, systematic planning backs your program. Program development is a process for planning, implementing, and measuring the success of board, staff, and volunteer efforts. A logic model adds value to each stage of program development by showing the relationships among program components. A logic model is merely a picture of how your program works. It presents a visual display of the connections among the resources available to operate the program, current and planned activities, and changes or results you hope to achieve. A logic model is a mechanism that helps you formulate program strategy while communicating to funders and others that the program is backed by integrated, systematic planning. Start building your logic model by developing a comparison baseline for determining whether change has occurred as a result of what your program does. You might organize a logic model committee or workgroup and schedule brainstorming sessions to identify the major issues and concerns facing fathers in the populations you serve. In the logic model, state the issues and who is affected. Identify areas of strength and weakness. 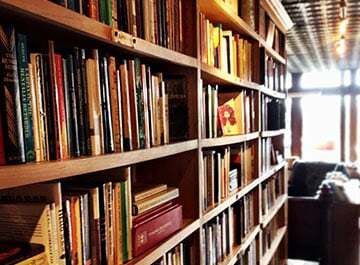 Consider the resources currently available as well as the ones you will need to operate your program. Inputs are the resources that are invested in a program. In your logic model, include the human (board, staff, and volunteer time), financial (grants, donations), knowledge (research, curricula), and community (involvement of external organizations and collaborators) assets that demonstrate program quality. 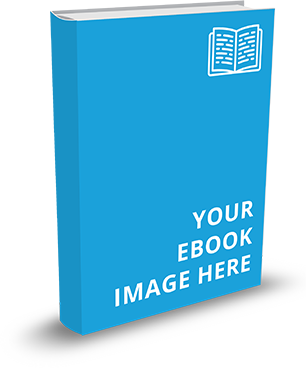 Additionally, specify organizational inputs such as facilities and equipment. Outputs are the direct results of program activities. They are what they program does and the people it reaches. Outputs can include workshops, counseling, volunteer development, training, distributing publications or other materials, or health screening. Outputs often are described in terms of scope, such as the number of training sessions attended. Outputs also can be depicted in terms of characteristics or behaviors, such as the degree of satisfaction with program services. Outcomes, or impacts, are the benefits or changes that result from your inputs and activities. Outcomes can be individual, measured as changes in knowledge, attitudes, skills, behaviors, or status. For example, one desired outcome might be increased demonstration of fathers' involvement in the lives of their children. 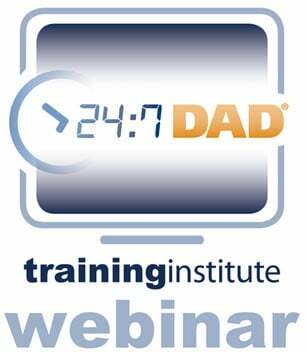 Programs that promote responsible fatherhood also can measure outcomes at the system or community level. A desired outcome might be changes in policy that make child support guidelines more father-friendly. Outcomes you work toward can be short-term (within a few months), medium-term (approximately 1 year), or long-term (2-5 years). While short- and medium-term outcomes tend to be easier for programs to measure, evaluating long-term outcomes is important for indicating how your program fosters sustained change. There is no right or wrong way to fashion a logic model. Through simple pictures and words, the logic model should reveal how your program will work and what you expect it to achieve. The logic model should explain your program without supplying unnecessary detail or confusing readers with too many boxes or arrows. As you shape the logic model, remember that people are the link between the situation and the impacts. Whether the workgroup began to conceptualize the logic model by evaluating the situation first, or started with desired outcomes in mind and reversed the process, the model should have a logical sequence when read from either direction. And just as your program changes over time, so too should your logic model. Ongoing review and assessment will keep the logic model fresh and responsive to the evolving environment that is inherent in serving fathers. Hopefully creating a logic model will help to get you started off on "the right foot" with your fatherhood program, and will help everyone involved to understand what's needed and where you are headed.